Cook spaghetti in salted, boiling water according to package instructions, until al dente. Drain and set aside. Meanwhile, preheat the oven to 160°C/320°F. Cut shallots, garlic, tomatoes, mushrooms and carrot into fine cubes. Sauté the diced shallots, garlic, mushrooms, and carrot in vegetable oil for approx. 3 - 5 min. Next, add tomatoes and sauté for an additional 3 min. Season the vegetables lightly with salt and pepper. Add tomato paste and sauté as well. Pour in pureed tomatoes and reduce to low heat for approx. 10 min. In another pan, sear ground beef with some vegetable oil. Season with salt and pepper. As soon as the meat has browned add it to the vegetables and bring to a gentle boil. Season the sauce with oregano, sugar, salt, and pepper. Next, cut fresh basil into strips and fold into the sauce. 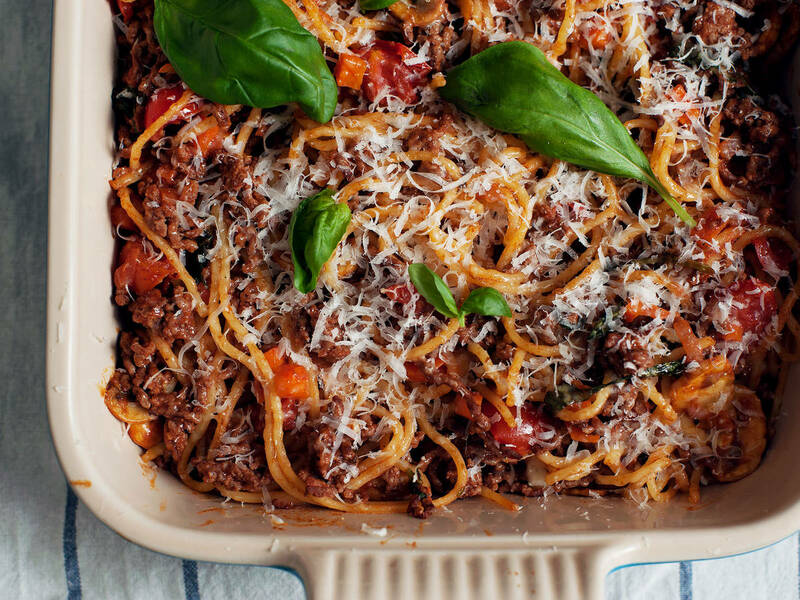 Put the spaghetti into a casserole dish and pour the sauce on top. Mix slightly and sprinkle with grated Parmesan. Bake in a preheated oven at 160°C/320°F for approx. 7 min. Serve warm from the casserole dish.